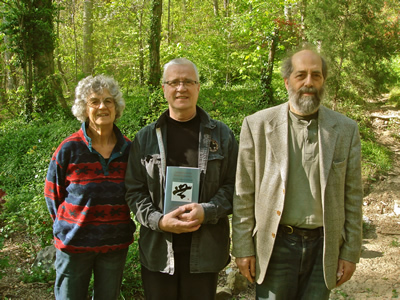 Zen Master Dae Gak's new book Upright with Poise and Grace has been published and can be purchased both through Amazon or directly from Furnace Mountain. Editors: Jonathan Greene and Dobree Adams. Please consider ordering directly through us, as your purchase supports Furnace Mountain 100%. To order a copy, please send an email to Myozen, including your complete name and shipping address and the number of copies you'd like to purchase. Zen Master Dae Gak’s words invite the reader into the enriching practice of sitting and surrendering fully. My favorite lines from Upright with Poise and Grace are, “To fully listen is to die to what is heard. There is no intimacy without a willingness to be fully changed by the encounter.” Zen Master Dae Gak reminds us that the willingness to be changed in every encounter lives in us as a state of wonder and joy. I’m so grateful for these heartfelt stories of opening to the intimacy and fullness of life. Listening is a sacred, transformative practice and Zen Master Dae Gak´s words illuminate this fact. Upright with Poise and Grace is an extraordinary gift! 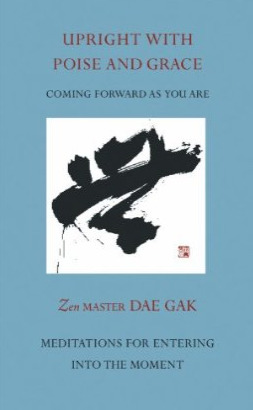 In Upright with Poise and Grace, Zen Master Dae Gak offers us a rich combination of reminiscences, poems, and dharma-talks – each one pointing directly to the aliveness of our lives as they are. Urging us to abandon whatever plan we have for our spiritual journey, Zen Master Dae Gak encourages us again and again to rely on what is already here and to embrace the unfolding of our lives as The Way itself. Upright with Poise and Grace is a tender, wise, unpretentious and compassionate book that rings with clarity. It made me laugh, gasp and cry. I just loved it. Zen Master Dae Gak tells us stories about his life as if talking to a friend over a beer - warm, unpretentious and personal. And behind all the words the Truth reverberates, unmistakable and clear as a bell. In Upright With Poise and Grace I love the calligraphies, poems, and how Zen Master Dae Gak has distilled simple clear messages in very reader friendly chunks. What Zen Master Dae Gak has done is wonderful. Upright With Poise and Grace is constructed in short, clear meditations, which flow and resonate at the level of the heart. Zen Master Dae Gak’s book Upright with Poise and Grace is wonderful. Totally unique. I could go on and on. Thank you Zen Master Dae Gak. Beginning to read Upright With Poise And Grace, brought up my love for Furnace Mountain and remembrances of what makes my experience there so special. I am most struck by Zen Master Dae Gak’s simplicity and directness. One statement from the introduction that illustrates this is "...there is not an ideal to strive for but an actuality to embrace." Of course this is consistent with other Buddhist teachings I've read and heard but something about the direct and simple way Zen Master Dae Gak teaches gets under the radar of my confusion and resistance. Upright with Poise and Grace is an intimate portrayal of a great Zen Master’s teaching, life and deeply compassionate heart. I recommend it whole-heartedly. Zen Master Dae Gak combines the openness of his own heart with his deep knowledge of the Dharma. This book, Upright With Poise and Grace is a validation, confirmation and consistency of the invisible thread we call the Dharma. I find refuge in its reassurance of a life outside the mundane. Zen Master Dae Gak points the way for all of us. What I love about this book is that whenever I open it on any page it speaks to me in a profound way.